Lost Tongue Overlook is a dragon lair on the Jerall Mountains south of Riften. It is guarded by a leveled dragon after Dragon Rising has been completed. Before this it is home to a boss necromancer and their minions. The path to the lair is a short way past Snow-Shod Farm going south from Riften. It wends its way around before reaching a fork in the path; taking the left-hand path takes you past a dragon mound and a burnt carriage that has been attacked by the dragon. Several flights of stairs lead up to the lair. (The path continues past here and passes Crystaldrift Cave before making a full loop.) By the start of the stairs is the first of several piles of rocks marking the route. Partway up the stairs, there is a switchback in the path with an Iron Ore Vein. If Dragon Rising has not been completed, a skeleton will be creaking about here as well. Two further flights up there is a spellcaster trap that unleashes the Ice Storm spell when triggered. 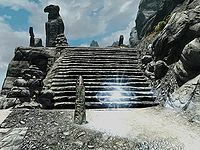 It is possible to climb nearly to the top of the stairs and snipe the soul gem from the pillar with an arrow. This will deactivate it. Alternatively, you can try going to the left around the stone and approaching it from behind. 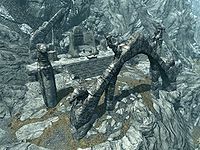 One further flight of stairs brings you to a plateau with a couple of burnt corpses on it that can be looted for a few septims or a sample of bone meal. There are a few stone pillars and arches which are the remnants of the ruin that once stood here. To the east-southeast is the word wall. If the dragon hasn't detected you yet, it will be resting atop the wall. Once you have dealt with it, climb one further flight of wide stairs to the word wall itself, which teaches you part of the Dismay shout. A lootable skeleton and a boss chest containing leveled loot are by the word wall. It is possible to ride a horse up the east slope of the hill, and avoid the trail and spellcaster trap altogether. There is an unburned corpse located to the east of the first plateau. 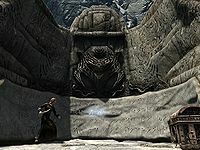 It is a few paces past the easternmost stone pillar and right next to a large rock, and wearing a Stormcloak helmet and cuirass. At times the spellcaster trap will not appear (or the trap will be there but the soul gem won't); however it will continue to operate with no way to disable it. It will also kill you in one hit regardless of health. It is possible that the spellcaster trap will continue to operate even though the soul gem was shot down from the trap. Sometimes this can happen if you make a follower pick up the soul gem or if it gets dislodged without picking it up. Walk around the outside edge of the pillar to avoid the spell. ? The dragon may become stuck to the word wall, and will be invincible. Revisiting the area at a later date appears to fix this. Sometimes the sound effects will play, however you may not be able to obtain the word of power from the wall due to the word not lighting up. This page was last modified on 23 November 2017, at 02:01.